From left: Chris Savino, Mackenzie Thompson, gallery co-owner Sallie Hirshberg, and Jesse Doe. Jordan Russell Leishman might have gotten away it if it weren’t for three college students leaving a Super Bowl celebration. The Boston University seniors were walking home on Newbury Street after watching Sunday night’s Super Bowl festivities on Boston Common. It was quiet until they reached the Galerie d’Orsay shortly after midnight, when the students noticed a smashed window and heard an alarm going off — then saw a man carrying four paintings. “We’re looking at each other, and we’re like, ‘I think he just stole those? We should probably do something,’’’ said Mackenzie Thompson, 21, of Shelton, Conn.
Leishman, the alleged thief, dropped the paintings as he attempted to flee, the students said. The three students sprinted after him, with Thompson reaching the 29-year-old Chelsea man and grabbing him in a bear hug. 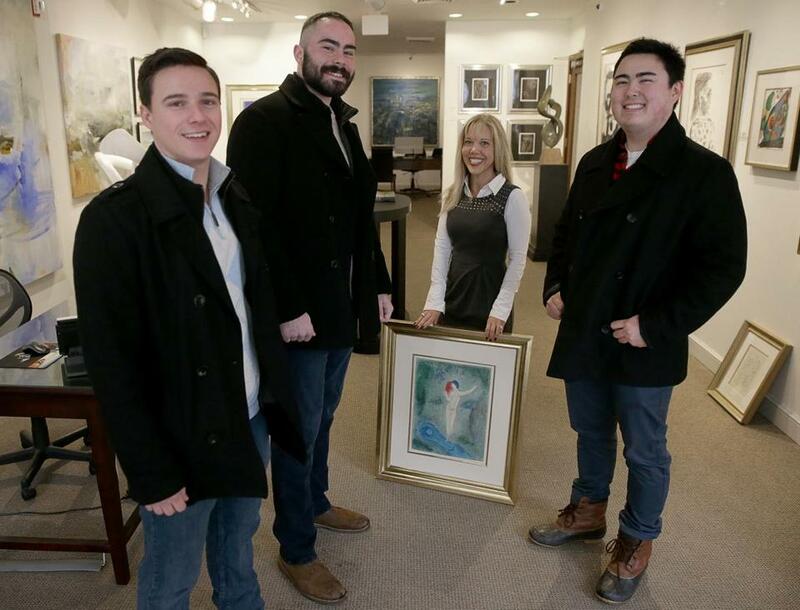 As the 6-foot-3-inch Thompson pinned the robber against a mailbox, 21-year-old Chris Savino and 22-year-old Jesse Doe picked up the museum-quality paintings off the street, waving them in the air to flag down a nearby Boston police cruiser. “I held up the paintings, like, ‘Hey, someone stole these, so can you please come over here?’ ” recalled Savino, of Ridgefield, Conn. The business students returned to the gallery Saturday afternoon to meet its co-owner, Sallie Hirshberg, herself a BU grad. While Hirschberg said it will cost around $5,000 to fix damage to the hand-carved frames, the art itself was unharmed. The stolen pieces were etchings by Pablo Picasso and Rembrandt and lithographs by Joan Miró and Marc Chagall. 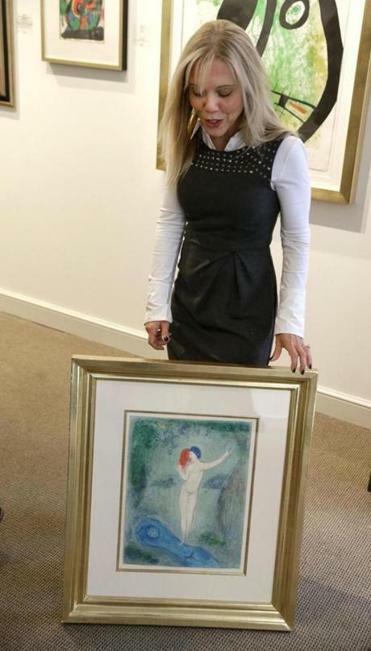 Leishman took a fifth piece off the walls — “Daphnis & Chloe,” a colorful lithograph by Chagall — but left it in the entryway. Altogether, the five paintings were valued at around $45,000, she said. Hirschberg said footage showed Leishman breaking a window of the exterior door and then another window in the main door that opened into the gallery. Galerie d’Orsay co-owner Sallie Hirshberg with one of the paintings that was stolen, then recovered. Then, to Hirschberg’s confusion, he waited about 20 minutes in the entryway before finally reaching through the broken glass to open the main door — a motion that immediately triggered the security precautions, she said. “Boom, it was a full-fledged alarm,” she said. Leishman’s choices for his would-be art heist were odd, according to Hirschberg. He took an $1,800 Picasso etching but left behind another Picasso worth $90,000, and he bypassed a $90,000 Rembrandt for a similarly sized Rembrandt worth $7,500. Leishman was arraigned on multiple charges Monday in Boston Municipal Court, where he was ordered held without bail on a pending assault case from January. He was also wanted by law enforcement in New Hampshire, although further information about that case was not immediately available. The three students said they didn’t consider their own well-being during the chase until Thompson grabbed Leishman. “In hindsight, [our safety] should have been more of a concern, but it happened super quick,” said Doe, who is from Belmont. Though Boston police are grateful that an arrest was made, “we don’t want anyone to get hurt physically confronting potentially violent suspects,” said Boston police officer Stephen McNulty. McNulty, who confirmed that Leishman was caught by witnesses and pinned against a mailbox, said the department encourages people to call 911 when they see a crime in progress. The students said the officer’s response was to arrest Leishman, and after leaving the artwork on the hood of the police cruiser, they returned home. Hirschberg invited the students to an invitation-only showing later this month, where she plans to give them art from the gallery itself as thanks for their intervention. Correction: Because of a reporting error, Chris Savino’s name was misspelled in an earlier version of this article.